Director – Joseph Kosinski, Screenplay – Edward Kitsis & Adam Horowitz, Story – Edward Kitsis, Brian Klugman, Adam Horowitz & Lee Sternthal, Producers – Sean Bailey & Jeffrey Silver, Photography – Claudia Miranda, Music – Daft Punk, Visual Effects Supervisor – Eric Barba, Visual Effects – Digital Domain, Mr. X Inc (Supervisors – Janelle Croshaw & Aaron Weintraub), Ollin (Supervisor – Charlie Te Iturriaga), Prana Studios Ltd, Prime Focus (Supervisor – Chris Harvey), Special Effects Supervisor – Alex Burdett, Special Effects Costumes – Quantum Creation FX, Production Design – Darren Gilford. Production Company – Disney/Sean Bailey Productions. Kevin Flynn has been missing since 1989 meaning that the controlling share of the ENCOM corporation has been left in the hands of his son Sam. Kevin displays no interest in running the company and the board does so in his absence. Sam then breaks-in to the company mainframe and distributes the new version of the OS they are planning to launch free to the internet. Afterwards, Flynn’s old friend Alan Bradley comes to Sam, informing him that he has received a page from Flynn that appears to originate from the videogame arcade that Flynn used to run. In the basement of the arcade, Sam activates Flynn’s old computer and suddenly finds himself transported inside the digital world of The Grid. There Sam is made to compete in various game arenas before it is discovered that he is a User. He is taken before what appears to be his father but discovers that this is Clu, a program created by his father that has usurped control of The Grid. Rescued by Quorra, the last of a race of creatures native to The Grid, Sam is taken to meet his father. The only hope to bring Flynn back to the real world is to get to the exit portal; however, Clu’s minions guard the way there. Clu pursues them, seeking to obtain Flynn’s identity disc, which will allow him to adopt Flynn’s identity and enter into the real world. Tron (1982) was a groundbreaking film that was way before its time. This was never apparent during its initial theatrical run where it received mixed reviews and was not a box-office success. However, it was the first film, aside from the rebel conference scene in Star Wars (1977), to use computer-generated effects and opened up a technological world that led to Pixar and the CGI effects revolution of the 1990s and beyond. On a conceptual level, Tron conceived of Virtual Reality before anyone ever thought of the idea and was the first film to depict cyberspace before William Gibson coined the term and the World Wide Web ever came into existence. Over the years, Tron became regarded as a cult classic and there have been plans since the late 1990s to make a sequel. For a number of years, original director Steven Lisberger was planning a sequel to be called Tron 2.0. There were various stalled plans throughout most of the early 00s, which never amounted to anything until Disney brought director Joseph Kosinski in to make a promotional trailer that was referred to at the time as Tr2n. Tron Legacy emerges as part of Disney’s overhaulings and remakes of its classic and animated films that started in the mid-1990s with the likes of The Jungle Book (1994) and has continued through 101 Dalmatians (1996), That Darn Cat (1997), Flubber (1997), The Parent Trap (1998), Freaky Friday (2003), Herbie: Fully Loaded (2005), The Shaggy Dog (2006), Race to Witch Mountain (2009), Maleficent (2014), Cinderella (2015), The Jungle Book (2016), Pete’s Dragon (2016), Beauty and the Beast (2017), Mary Poppins Returns (2018), Aladdin (2019), Dumbo (2019) and The Lion King (2019). It is important to see that the world that Tron Legacy enters into is a very different one to the one that Tron came out in. Tron came out before the existence of the internet; Tron Legacy comes out at a time when most of our lives are lived online in terms of social networking, gaming, chatrooms, internet dating, and where online shopping and news have rendered increasingly obsolete concepts that were solid fixtures of society in 1982 such as retail outlets and newspapers. Tron Legacy comes in the era of Windows 7; Tron came out before the advent of Windows or even the graphical user interface – in the original, you can see all the computing being conducted by typed command line interface. Nowadays, we casually carry computers with us in our portable phones; Tron came out at a point where IBM had only released their popular home computer and MS-DOS 1.0 the year before, the 3.4 inch floppy disk the same year and when the phone was still attached to wall sockets by cords. Tron was very much a product of the era of the arcade videogame where the top-selling items were Pac-Man, Donkey Kong and the 8-bit Space Invaders where one shot at aliens as they inched across the screen in two-dimensional lines; Tron Legacy comes out into the era where videogaming has expanded into the immersive three-dimensional likes of World of Warcraft, Final Fantasy, Resident Evil and gone from the arcade to home consoles, the X-box and the MMORPG, which were not even ideas in anybody’s mind at the time of Tron. Tron came at a time when computer animation was in its infancy and largely limited to simple wire-frame shapes and primary colours; by the time of Tron Legacy, this has advanced to the point that 61 year-old Jeff Bridges can be placed in a motion capture suit that renders his features nearly thirty years younger inside a computer environment to create the alter ego of Clu back at the age he was in the original. On the other hand, despite 28 years of technological evolution, Tron Legacy is hard pressed to do anything as innovative as Tron did in its day. The problem is more one that Tron predicted the existence of the virtual wired world; by the time of Tron Legacy, we are in essence living inside The Grid. Other films have made the use of CGI animation and depiction of virtual space seem everyday. More to the point, most of the ideas of Tron have been usurped by the new cyberspace paradigm embodied by The Matrix (1999) – the fight sequences where Garrett Hedlund is placed on the game grid owe more than a few leaves of inspiration to The Matrix, for instance. The rest of the film largely builds out on what Tron laid down – thus we get more elaborate light cycle sequences that now take place on a racetrack that loops around multiple levels rather than at right angles on a two-dimensional grid, and a more elaborate version of the solar sailer in the form of the light train. At most in terms of original ideas, Tron Legacy toys with the idea of lifeforms evolving inside The Grid (although does surprisingly little with it, especially when it comes to the badly underdeveloped character of Quorra). There is a surprising lack of cutting edge ideas to be found here, more a standard reliance on what has gone before. There is also a disappointing lack of thought gone into the depiction of the virtual realm – like vehicles experiencing inertia effects or giving off pollution trails, or even for that matter what purpose a bar would serve in cyberspace or why people would eat meals, things that are commonplace in the real world but have no relevance inside a virtual environment. Certainly, Tron Legacy does a fine job in taking the original designs of Tron and building them out into something similar but new. The simple geometric look of the original become a more sophisticated digital world. 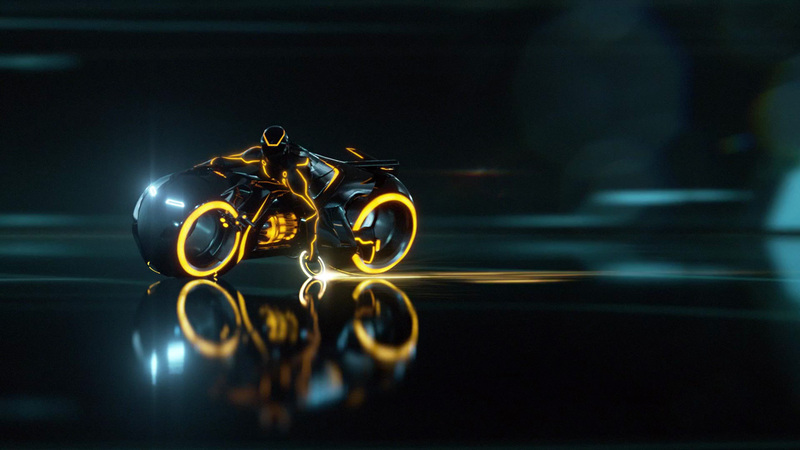 Certainly, in terms of its design and visual effects, Tron Legacy is a complete triumph. The new light cycle sequence is one of the most glorious effects sequences of the year, while other pieces like dogfight between the light planes dazzle. Tron Legacy is also one of the few films to come out since the deluge of 3D driven vehicles in the aftermath of Avatar (2009) to use the 3D gimmick in terms of atmosphere rather than as a novelty means to generate extra dollars on top of the ticket cost by popping a few items out of the screen into the audience’s faces. There is also a top-notch techno soundtrack from Daft Punk. On the other hand, Tron Legacy works far less in terms of a story (mindedly, that is a complaint that one could also make of Tron). This tends to draw on simplistic arcs familiar to the sf/action genre – vehicle chases, a dash of romance, a black-hearted villain with world-conquering plans, the race to get somewhere before a deadline, heroic sacrifices, the quest for a Hitchcockian McGuffin of vast importance and so on. The real question in comparing Tron Legacy to Tron is to ask whether there is anything in the film that is going to predict the way the world will be in thirty years time. I strongly doubt it. Like too many other films, it is a triumph of look and visuals but weakly strains at finding anything to say in terms of ideas. Disney subsequently spun out an animated tv series Tron Uprising (2012-3). Disney announced plans for a third film but then cancelled these. Joseph Kosinki next return to the science-fiction genre with the conceptual breakthrough film Oblivion (2013), followed by the non-genre firefighter film Only the Brave (2017) and the upcoming Top Gun: Maverick (2020).